Our modern world can seem a daunting place, changing rapidly under technological trends, global trends, cultural trends. It is easy to feel alienated and estranged from so many dynamics shifting so fast. Social media certainly provides never-before explored avenues for inner-connectivity, yet many people cite social media platforms and online interactions as one of the roots of their anxiety, discontent. In short, it can feel lonely to be a person these days, in spite of all our technological marvels, or to a degree, because of them. We have more information at our disposal than at any time in human history, but find a lot lacking when it comes to real connectivity, communication, community. As always, art can reveal the solution. It is what humankind has used throughout time to break through solitude, reach out to others, and connect. From its purest and most primitive form in the cave paintings to all the great works of art to the present day, art has been humankind’s most rewarding way to combine communication with emotion. So to take painting in particular: it is an art form that inspires wonder, curiosity, and discussion. People come together in temporary communities when they view the exhibits in the gallery; they talk to each other about their interpretations. And maybe much of the wonder is that, at least at one time, we all of us were painters. As children, we finger painted, drew pictures with our crayons, sketched in our elementary school art classes, etc. Of course, most of us discovered our true talents lay elsewhere, and moved on to others interests and, eventually, careers. However, whether we have any ability with a brush or not, there is an aspiring live artist at the core of all of us. Which brings us to now. Because today there are artists who are bridging the gap between the painter and the appreciator, painter, and subject, artist and audience. With them, a classical form is updated with the current. In this age of user-driven content, these artists are finding inventive ways to modernize not only art but the role of the artist itself. Heidi Schwartz is the premier live event painter in the country. 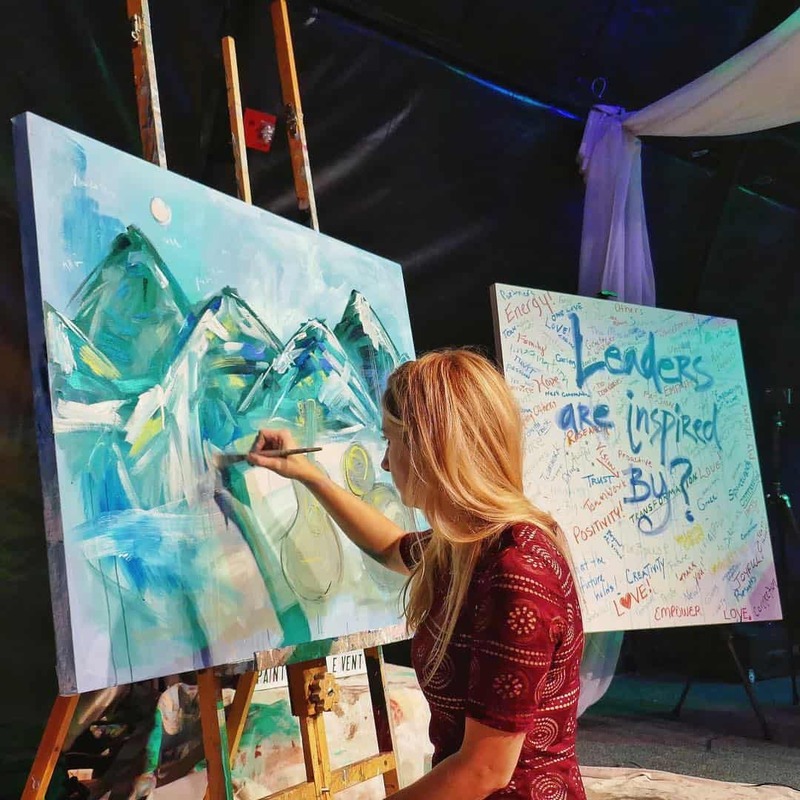 At corporate galas and retreats, fundraisers, trade shows and showcases, Heidi brings her studio with her, setting up in the midst of the festivities and the crowd, and renders the event onto the canvas. She draws on the décor, the atmosphere, and most importantly, the people, to create a one-of-a-kind impressionistic piece that represents the texture and spirit of an event in a way no simple documentation ever could. In these spaces, Heidi has already merged the roles of artist and performer, making the act of creating an event unto itself, a part of the entertainment that never fails to transfix the attendees. However, now she’s gone further and is bringing the gathered even closer to the creative act with an innovation. The Wall of Inspiration is a concept wherein the guests are invited to add their ideas and thoughts to the initial canvas. If a fundraiser, they can describe what they admire about the cause being highlighted. If it is a corporate showcase, what are their expectations for the evening? What is their encapsulation of the event? What do they find most rewarding or inspiring? Everyone involved is welcome to add her or his personality to the Wall of Inspiration. Then Heidi takes these contributions and creates the painting from these elements: artist and subject, performer and audience, now all collaborators, not just in the evening’s festivities, but in the actual painting. Paintings. Because Heidi then gives the original Inspiration board an artistic makeover: dressing up the guests’ words in graffiti artwork. True collaboration – live artist and guest working on the same canvas. By the end of the event, there are two paintings: Heidi Schwartz’s impressionistic take on the event utilizing the scene and the guest’s words for inspiration, and the guest canvas itself, now done as an abstract collage. In one the gathered community has supplied the raw material of ideas and feelings, which the artist uses to feed the developing painting. Also, in the second their tangible work is joined right there with the artist, each one contributing marker and brush strokes onto the canvas. Everyone is a part of the performance and entertainment, and everyone has taken part in commemorating the evening in two unique works of art that will last forever. So they are artworks in which multiple hands were involved, the product of collaboration between a talented artist and a skilled audience. Here is a genuinely modern wrinkle on painting. The Art of Everyone Project has invented laser-guided speed painting. Unique, it is also straightforward in its concept. A blank, semi-transparent canvas is erected. The artist stands on one side and a guest on the other. The artist doesn’t touch the canvas. Instead, her or his role is to guide the guest to do the painting. They do this with voice prompts, and a laser pointer. The guest on their side of the canvas emulates the swoops, arcs, and contours the laser pointer makes on the other side. In this, it is like a guided tutorial or a spontaneous art class. And the customized techniques involved renders the image on both sides of the canvas so that painting produced is a double-sided like a two-way mirror. Moreover, just as the painting emerges on both sides of the canvas, so too does the artist appear on each side, giving a visual testament to the rewards of sharing and collaboration. Painter Alexa Meade does not just close the gap between live artist and subject; she closes the gap between subject and canvas. For her canvas often is the human face and body, as well as objects and three-dimensional spaces. It is a craft with a heavy influence of illusion, as with bold but careful application of paint she can turn three dimensions into two. Whereas say a classic portrait painter would take the sitting subject and the surrounding space and interpret the play of light and shadows and perspectives onto the canvas, Alexa reverses the poles, and the subjects and surrounding area become the canvas. The human form and features are illuminated in color, made ambiguous by applied shadow, traced and daubed with mystery. Here Alexa has to alter the work to account for the angle of a cheekbone, the slant of a jawline, the bend of a wrist. An impression of the subject does not form the basis of the painting – the subject becomes the impressions themselves. In this way, each work is truly different, not just from the artist but from the inimitable differences and the variety between each subject/canvas. While Alexa controls all of it, it is also the very essence of collaboration. At heart, none of the innovations of these artists strays far from the oldest, purest purpose of art: to create a space that allows hearts and minds to freely touch and learn from one another, to express that which otherwise could not be expressed, and together, artist and appreciator, to make something that was never there before.